Tungsten or advanced tungsten alloys are considered to be the most suitable material for plasma-facing components in future fusion reactors such as DEMO. In these nuclear devices tritium retention in neutron-damaged tungsten will become a more significant issue. In order to study the influence of material displacement damage on fuel retention, high energy ions are used as neutron surrogate. Till recently all retention studies were performed by sequential high energy ion damaging and subsequent plasma/gas/atom loading of the material by hydrogen isotopes. However, in a real fusion reactor environment both implantation of energetic hydrogen ions and neutrals as well as damage creation by neutron irradiation will take place at the same time. 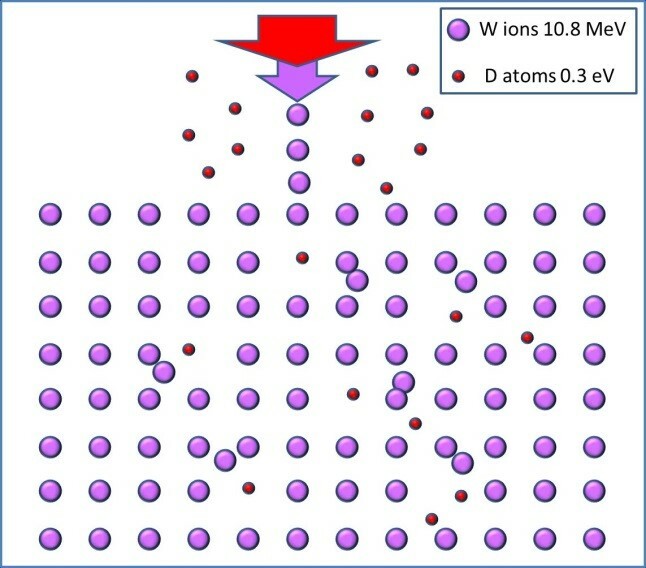 The researchers of Jozef Stefan Institute (Microanalytical centre) made one step further towards more realistic situation and performed experimental study where defect creation by 10.8 MeV self-ion implantation and D-atom-beam loading (E=0.28eV, j = 5.4×1018 D/m2s) was for the first time performed simultaneously in tungsten at five different temperatures between 450 K and 1000 K. Deuterium retention was measured by nuclear reaction analysis and gives a measure of the created defect density that were created during simultaneous W ion irradiation and D-loading can retain hydrogen isotopes. Synergistic effects were observed as predicted by theory, namely, higher D concentrations were found in the case of simultaneous damaging and D-atom loading as compared to sequential damaging at elevated temperatures and populating the defects afterwards. The observations are explained by stabilization of defects by the presence of solute hydrogen in the bulk that would annihilate at high temperatures without the presence of hydrogen. 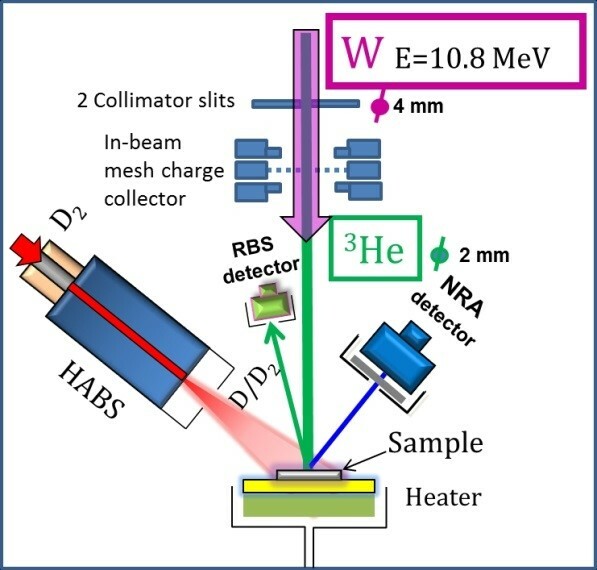 More in: S. Markelj, T. Schwarz-Selinger, A. Založnik, M. Kelemen, P. Vavpetič, P. Pelicon, E. Hodille, C Grisolia “Deuterium retention in tungsten simultaneously damaged by high energy W ions and loaded by D atoms” Nuclear Materials and Energy, 2016, http://dx.doi.org/10.1016/j.nme.2016.11.010 in press.